I'm currently in New York City for work (yep; again. 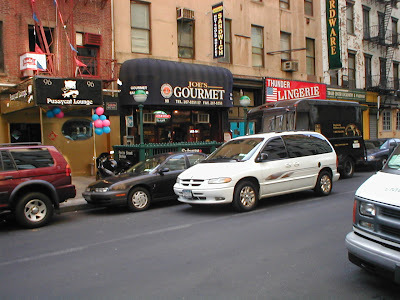 ), so I thought it would be fun to look back on my humble NYC beginnings. A little over five years ago, I got a six month internship in New York City. I was twenty years old and had just finished my sophomore year of college. I had visited the city a few times, but living there is quite a different thing. So even though I was excited to have such an adventure, I was also nervous to take such a big step on my own. Luckily I had arranged to room with a classmate from Cincinnati, so I wouldn't be all alone. In the months leading up to our start date, we searched endlessly for a suitable place to live. Craigslist became our number one stop on the internet, and we poured over listings for available apartments. There were plenty of options, but it was hard to tell how tiny/dangerous/smelly/rat-infested a place would be, based on three grainy photos and a description paragraph. Fortunately a young handsome man I called my fiancé lived a quick train ride from the city, so he was able to do some of the scouting for us. After a couple failed trips, Dustin was able to find us a suitable option. 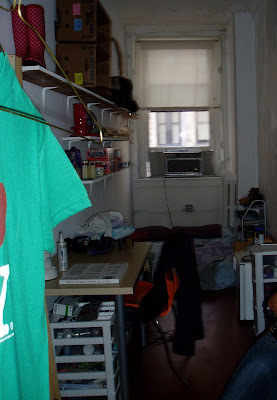 It was a single room in a four bedroom apartment located in the financial district of Manhattan. 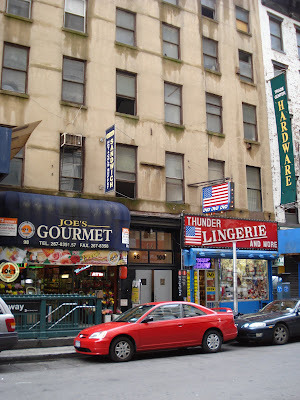 It was kind of an odd location, as there aren't a lot of apartments in the area, but it was safe, (semi) affordable and it was close to the subway. Score! Now at this point you may have noticed that not only is the apartment close to the subway, it's also convenient to some other....uh....ammenities. Specifically: The Pussycat Lounge (a "gentleman's club", naturally) and Thunder Lingerie. (go ahead, click the pic to enlarge...you know you want to see it in all its glory). I can't imagine the feelings my poor mother must have had when she dropped me off for my six month stay. Not exactly the dream you have for your daughter's first big city stint. Truthfully, we actually ended up loving the location- what other place in our price range comes with a doorman? (ok, he was actually the bouncer of the club, but still a comforting face to come home to on late nights). So, despite the somewhat questionable exterior, it was actually quite a find (by NY standards anyway). For $1,300 a month, we got access to a shared bathroom, 2-burner electric stove (no oven), the worlds smallest washer, and our very own window. We were living the dream, alright. It may not have been much, but we made it our own. A quick trip to Ikea (oxymoron alert!) 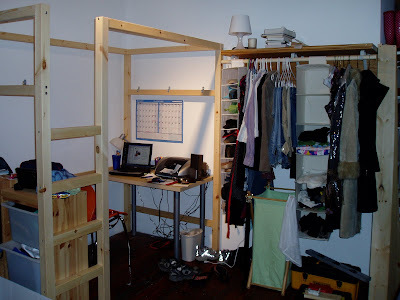 outfitted us with some brand new loft beds, a mirror or two, and a desk/vanity/dining table combo. What else do you need? Not pictured in the photo above? My bed.....I believe this photo was from our last few weeks there, after I had begun to dismantle things. My mattress ended up on the floor in the area by the window (where I slept with earmuffs on, to avoid a cockroach crawling in my ear like in Brokedown Palace). See? There's my bed. Such a cozy little nook. And in the distance is an air conditioner. Because we're fancy like that. It wasn't much, but for a brief time at least, it was ours. I have a ton of great memories of that apartment....and even the bad memories have sweetened over time. (I'm no longer disgusted by the mouse we found that had to be hunted down by our Italian neighbor- "I will keel zee MOUS!" And it's almost funny to look back on the time I worked out too hard at Capoiera and had to throw up in a plastic bag because one of the other roommates was hogging the bathroom...) I have a soft spot in my heart for that dirty little shoebox. 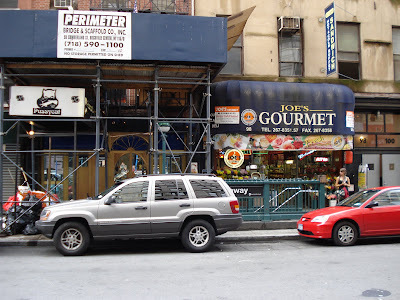 This summer, Dustin and I were in NY for my cousin's wedding so we stopped downtown to see my old stomping grounds. The doors to the apartment are silver now, and there is a bit more scaffolding due to all the construction in the area, but overall it hasn't changed much. I "heart" you New York. You and all your gritty charm.